I’m the managing director at The Loans Cafe. We have six mortgage brokers that work on home loans and most work from home. Nick and I work in here which is our central office. I personally knew the original owner of the business. Her husband used to work for me at Telstra and she wanted to move off and do other things and I was looking for a change so she invited me to come in and run the business. How long have you been at Stirling Business Centre? We’ve been at the centre for two and a half years. In February next year were coming up to our three year limit and we would love to stay if I’m being honest! Where were you before the centre? 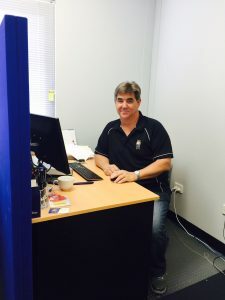 We rented a little office with a real estate company, just around the corner in Yokine. We then had a bigger office with a really different structure and found we had to downsize which is and ended up here. What attracted you to the centre? We had to leave our old offices and I was familiar with the centre as I had done a couple of training courses here. I was given a tour of the offices and so at the time I joined the waiting list to grab an office as soon as we could. What do you like most about the centre? Oh! It’s got all the facilities I need. It’s a professional space to meet clients. In, fact it’s much better than our last offices as we didn’t have a board room or meeting room which we can access here for when we need to meet with clients. I love the access to the kitchen and the parking! Another thing we love is the coffee machine here too, it was sad when it had to be repaired, that was a definitely tough few days! It’s also a great location for my business partner (Nick) and I. Three or four of us come and go from this office but it’s usually just Nick and I so it’s a great size for us. What is your go-to coffee order? We just use the Nespresso machine in the kitchen, Nick and I have tried many different flavours and we’re currently drinking Lor espresso – just black. I try not to have too many.